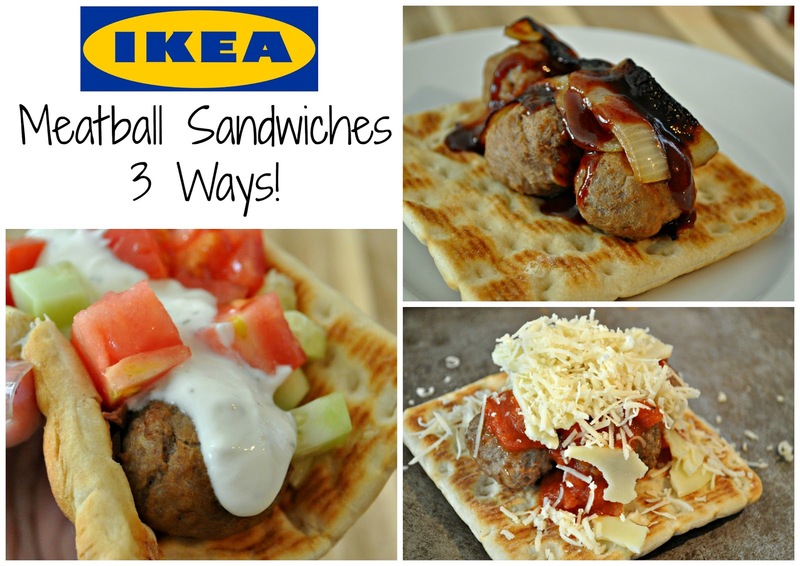 Food Hussy Recipe: Meatball Sandwiches 3-Ways with IKEA | The Food Hussy! I am kind of a fan girl with IKEA - and I'm excited to be an IKEA Ambassador for the next year in partnership with the West Chester store here in Ohio! I'll be sharing recipes as well as fun finds from my favorite store! We're starting off with what they're best known for - MEATBALLS! But the thing is - you don't just have to have these meatballs Swedish style! So I created three recipes for meatball sandwiches that are super quick, easy and - most importantly - delicious! I started out with a frozen bag of IKEA meatballs (mottbullar) - they have three styles now: regular, chicken and veggie. I used the regular meatballs for all of these recipes. I also picked up a bag of the Ikea Soft Bread (Brod Mjukkaka) to use for the bread. I quickly became a fan of the bread too! If you're not familiar - they have a whole food market downstairs near the checkouts! The bread and meatballs are in the freezer section and are affordable at just $7.99-$8.99 for meatballs and $1.99 for the bread! #1 is the Meatball Parmesan sandwich - the ingredients are super simple - and likely already in your cupboard! Marinara, provolone cheese and Parmesan cheese. I warmed up the bread in the microwave for just like 30 seconds and then topped it with the meatballs, marinara, provolone and Parmesan cheese. Then popped it into the oven for 7-9 minutes and it's ready! Just enough time for the cheese to melt and the sauce to heat up. Then - dig in! It was really good! I heated up all of the meatballs ahead of time - which can be done in the microwave or oven - then did the toppings. It was so simple and exactly the way I liked it! #2 BBQ Meatballs! I grabbed an onion and some sauce from my friends at Historic BBQ and came up with sandwich #2! This was super easy - I just carmelized some onion and then topped the sandwich with the onions and sauce. Now you could add cheese and broil but I just went simple. #3 Greek Meatball Sandwich! This was my original idea after tasting the IKEA meatballs on their own - they reminded me of gyro meat so I grabbed Greek yogurt, tomato, cucumber and kalamata olives for this one. I made a quick Tzatziki sauce (Greek yogurt, dill, lemon juice, garlic, salt, pepper) - it is so easy to whip up and yummy too. I used the leftovers on some Greek chicken the next day. It'll keep for a few days in the fridge - so you've got time. Then I made a little topping bar for this one - onion, cucumber, tomato and olives. I can easily say the Greek was my favorite - I love the sauce and it was very similar to a gyro! The meatballs from IKEA are such a great quick weeknight dinner option - you just heat them up in the oven or microwave and you're ready to go. I wanted to show you their versatility by bringing out three unique ways (other than the traditional Swedish) to meatball it up! Also - for the rest of November every Monday is Meatball Madness at the restaurant - you get 8 meatballs and 2 sides for just $1.99! And a Kids Meal for 99 cents from 2pm-close!